Want to stand out in a crowd? Try wearing stripes. It works for tulips! When our spring trial garden is in bloom, it’s a kaleidoscope of color. 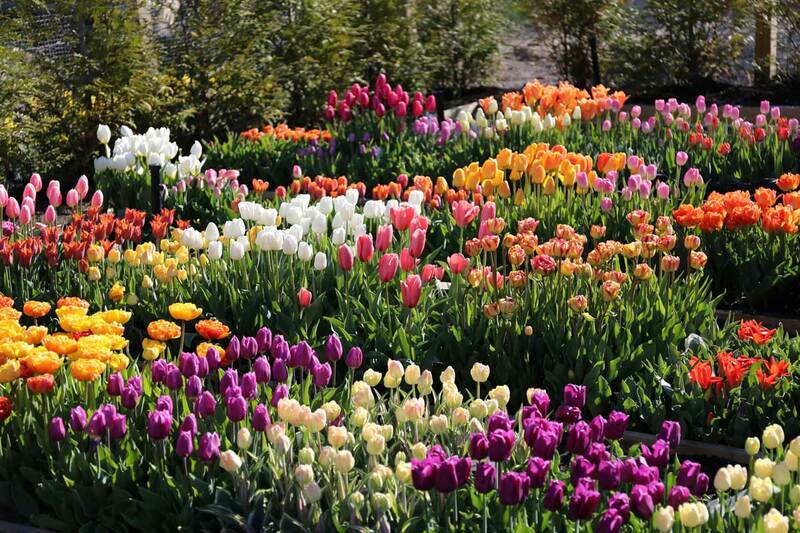 We plant 25,000 flower bulbs each fall, including more than a hundred varieties of tulips. During April and May, there’s so much color going on, that it’s hard to focus. Yet every spring, there are always a few varieties that grab our attention. This year, it was tulips with stripes. Everywhere we looked it seemed like striped tulips were some of the most vigorous, longest lasting and showiest tulips in the garden. They can really hold their own. 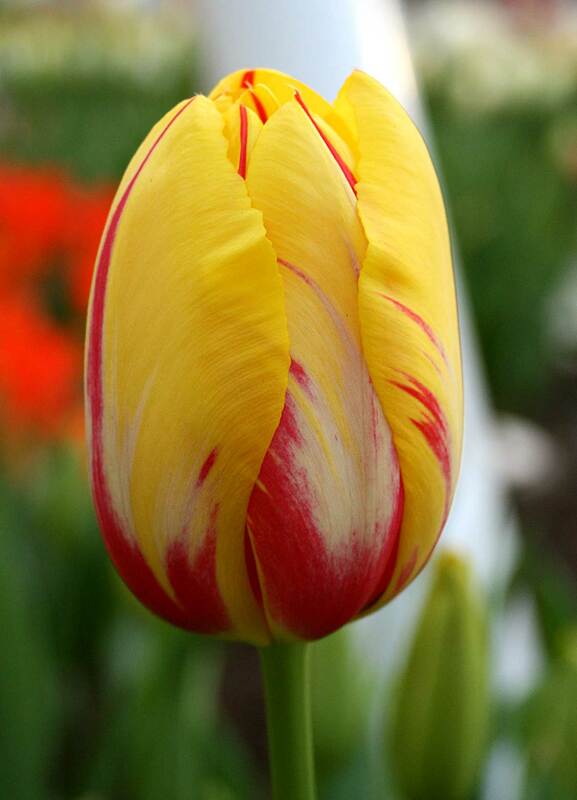 Tulips with striped petals have been popular for at least 400 years. In the 1600’s, they were at the heart of the collecting frenzy known as tulipmania. At that time, the feathering patterns were caused by a virus. 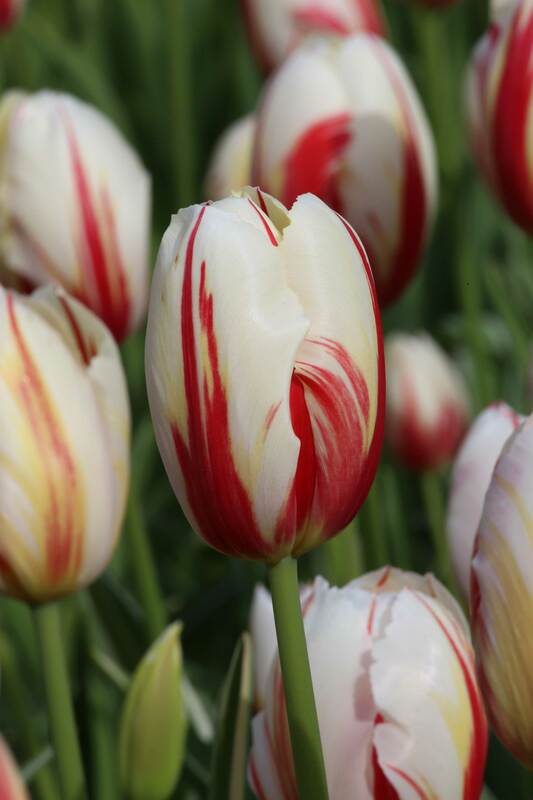 Today’s striped tulips are healthy varieties that were selected from plants with natural, genetic color variations. 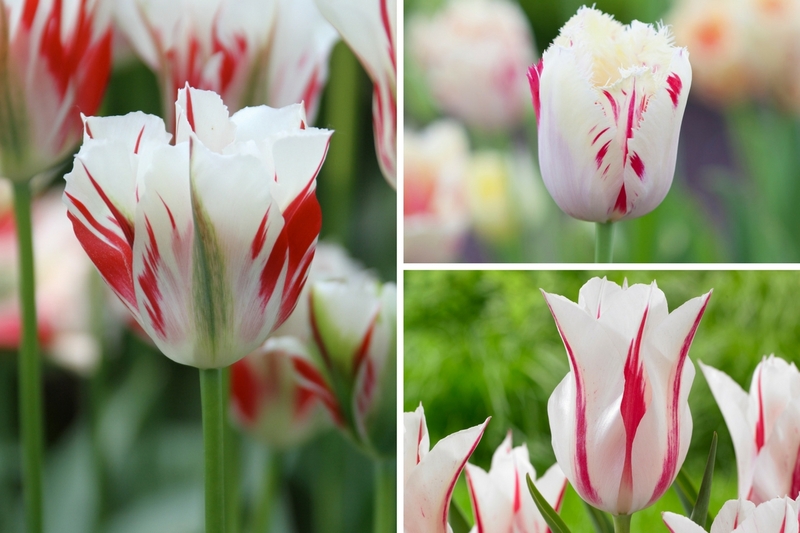 It’s not difficult to understand the appeal of these tulips. Each flower displays its own unique take on the color theme, with random flashes and flares, stripes and stippling. Every blossom that opens is a work of art. If you’d like to add a dash of excitement to your garden next spring, we recommend planting some striped tulips. They’re eye-catching from a distance and a marvel up close. Here are some of our favorites. Shown above are Grand Perfection (left) and Happy Generation (right). 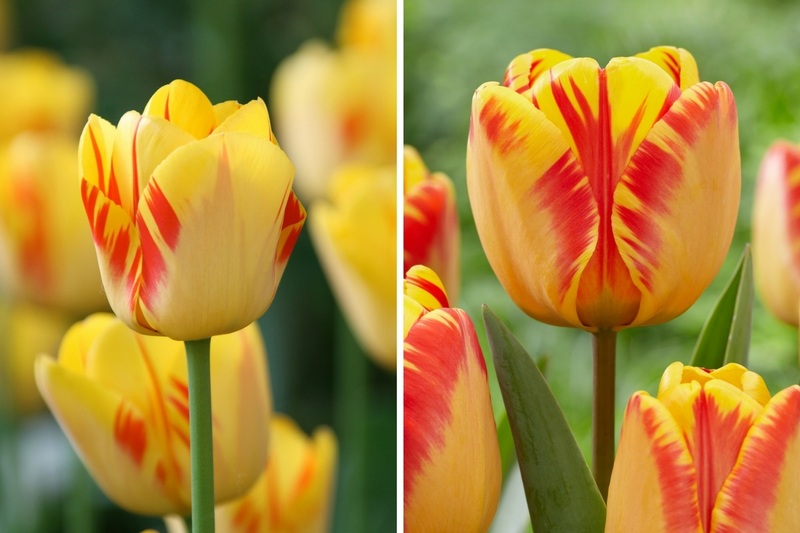 For tulips with an even more artistic flair, consider the viridiflora tulip Flaming Spring Green (left), fringed tulip Carousel (top) and lily-flowered tulip Marilyn (bottom). 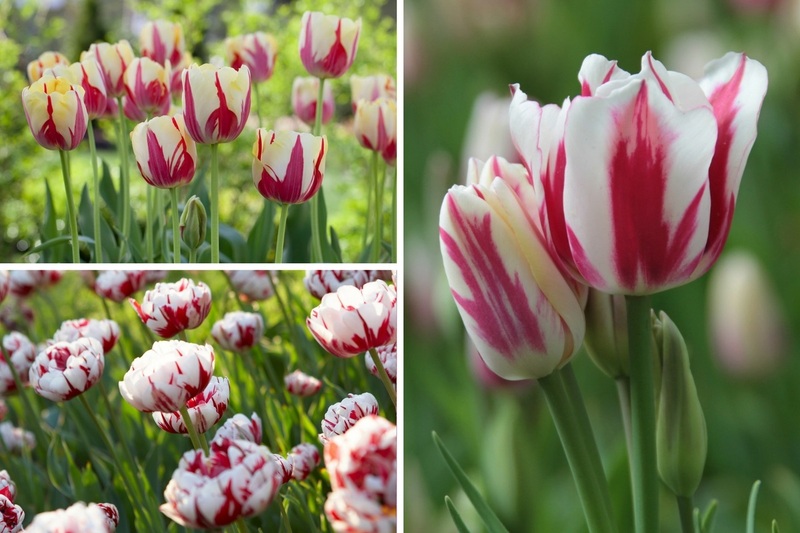 Stunning in the garden, parrot tulips are also among the world’s most sought-after cut flowers. Show above are Estella Rijnveld (left) and Texas Flame (right). 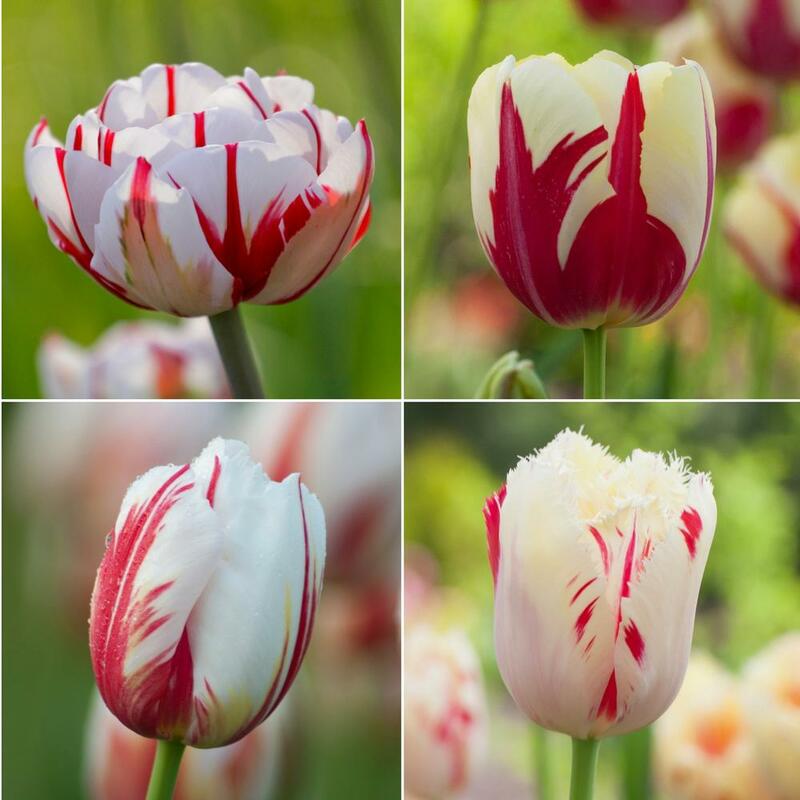 Late-blooming tulips with red and white stripes include (clockwise from upper left), single late World Expression, multi-flowering Flaming Club and the double late heirloom variety Carnaval de Nice. Shown above (clockwise from top left) are Carnaval de Nice, World Expression, Carousel and Happy Generation. Dare to go one step bolder? 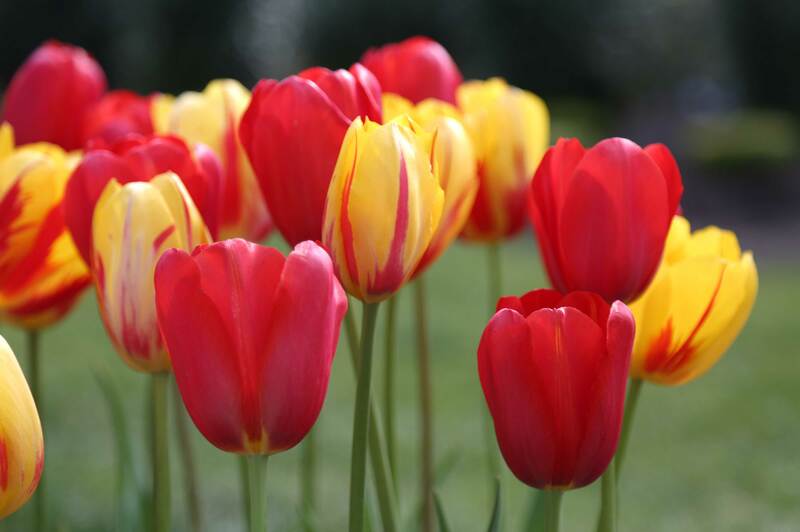 Consider red and yellow tulips! Kick off the season with early-blooming double Monsella. it’s the brightest tulip that we know of. 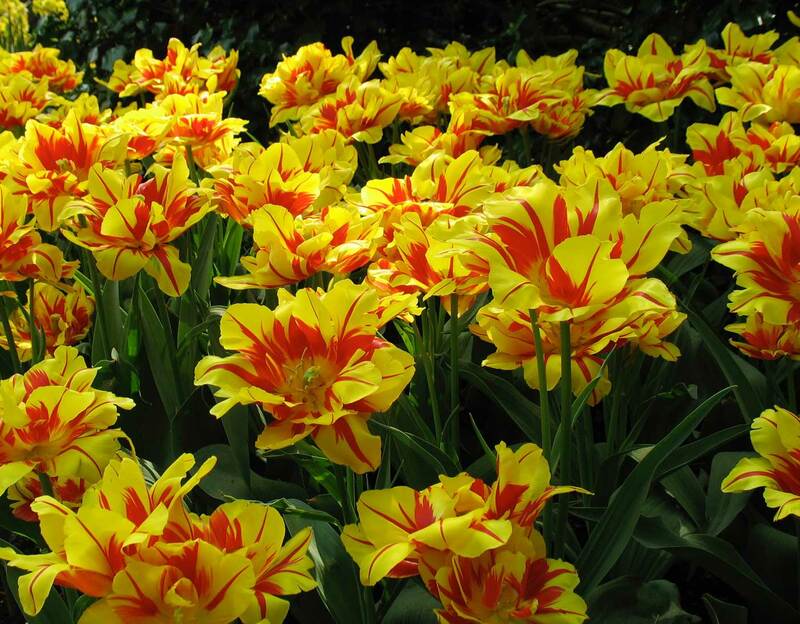 The next red and yellow striped tulips to bloom are Olympic Flame and Banja Luka. Both are Darwin hybrids, which means you’ll get nice big flowers on strong stems. End the season with La Courtine, a single late tulip. Single late tulips, sometimes called French, or cottage tulips, are heat resistant and have big, egg-shaped flowers on tall stems. 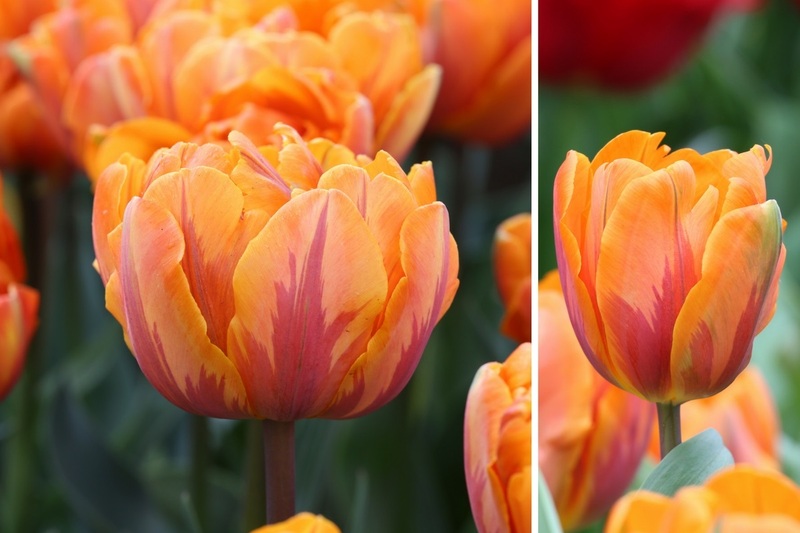 A couple other striped tulips that deserve a place in your garden include Orange Princess (left) and Princess Irene (right). I plant these two every year. Princess Irene blooms first, then Orange Princess extends the show for another two weeks. Both are relatively short, so they’re good for planting along a walk, at the front of a perennial border or in containers. 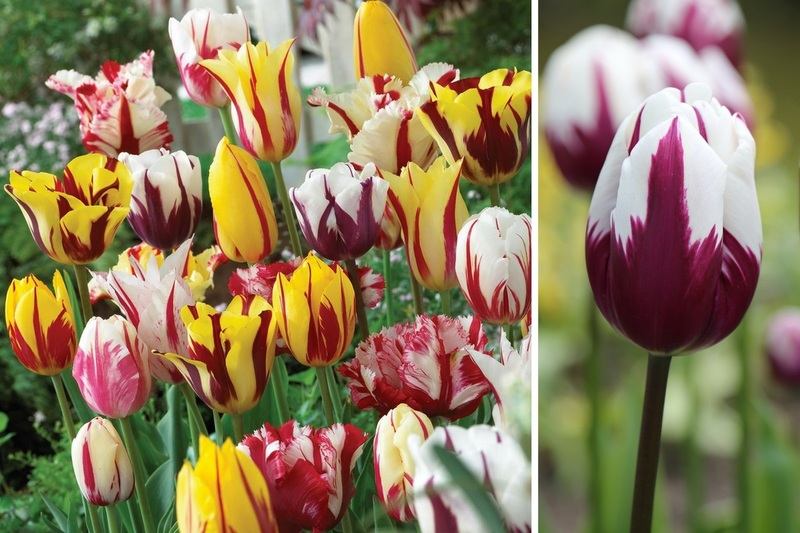 Another striped tulip to consider is Rem’s Favourite (above right), which is also known as Zurel. The flowers are a lovely swirl of blackberry and cream. 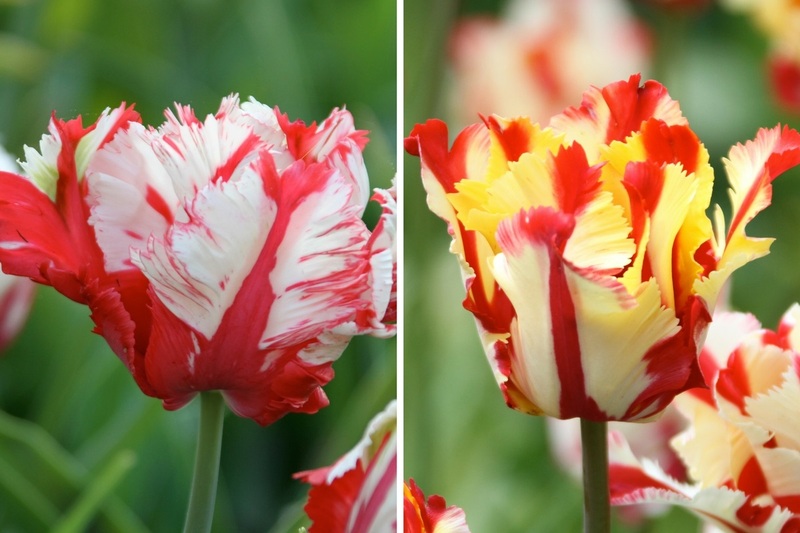 To get a full 16th-century tulip experience, plant Rembrandt Mix. Planting these striped tulips on their own will give you the biggest wow, but they are also fun to plant with solid colors. 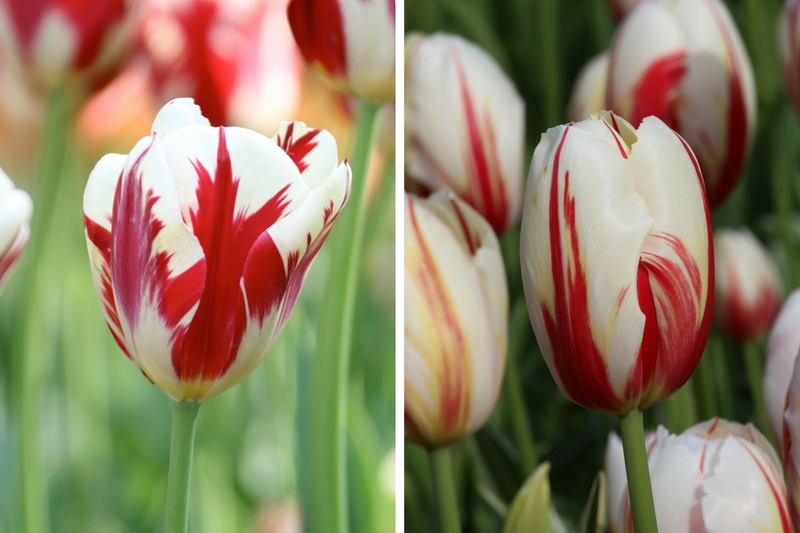 Some of the most popular tulip pairs include Banja Luka and Red Impression, Marilyn and Pieter De Leur and Carnaval de Nice and Midnight Magic.